Montréal, January 24, 2019 ─ The 14th Festival de Casteliers’ program is now online. This year’s not-to-be-missed event devoted to puppetry arts will celebrate France, as it welcomes four shows and many French artists, as well as puppeteers from the United States, Canada and Québec. The 2019 program features eleven shows for adults and children, including both internationally acclaimed landmark performances and new works. 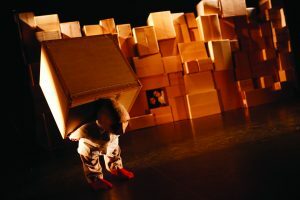 Kicking off the festival will be [hullu], brought to us by Blick Théâtre, a French company that creates wonderous theatre that juggles with reality and make-believe and combines puppets and humans. Montréal-based company Théâtre Magasin’s newest show for the whole family, Panique dans le piano! will top off the festivities. Puppets of all kinds – body puppets, table top puppets, paper puppets, hand puppets and string marionettes – will transport young and old to wonderful places that will inspire metaphorical and imaginative reflections on our world and its inhabitants. Imagination, madness, difference, wisdom, the life cycle and generational legacy are just some of the themes brilliantly addressed by the participating theatre companies. On top of this exciting program, Festival de Casteliers is also presenting two short pieces, an international roundtable discussion on contemporary issues in puppetry arts, as well as an exhibition marking the 90th anniversary of UNIMA, the international association of puppeteers. This year’s festival will also be the perfect opportunity to officially inaugurate the Maison internationale des arts de la marionnette (MIAM)! Founded by Casteliers and the Association québécoise des marionnettistes (AQM—Québec Puppeteer Association), this new centre dedicated to creating and presenting works, training, and cultural mediation is a Canadian first and will help promote puppetry arts, both locally and internationally. The program also features a café-causerie, a creative workshop for the whole family, an international professional networking event and the return of the ever-popular walkabout exhibition Marionnettes en vitrines! which showcases puppets in shop windows in the Outremont borough and in the Théâtre Outremont lobby. This year’s exhibition features puppets by sculptor Claude Rodrigue. Casteliers is pleased to team up with first-time partners Studio Théâtre de Studio Bizz and the Maison internationale des arts de la marionnette (MIAM) as well as with its long-standing partners: Théâtre Outremont, OBORO, the Commission scolaire Marguerite-Bourgeoys, the AQM and UNIMA-Canada (the Canadian branch of the international association of puppeteers). Casteliers would like to acknowledge the invaluable partnership with the Caisse Desjardins des Versants du mont Royal, the 14th edition’s Official Presenter. Casteliers would also like to thank the French Consulate General in Québec City and the Institut français for their generous support.